Product prices and availability are accurate as of 2019-04-18 00:08:28 EDT and are subject to change. Any price and availability information displayed on http://www.amazon.com/ at the time of purchase will apply to the purchase of this product. 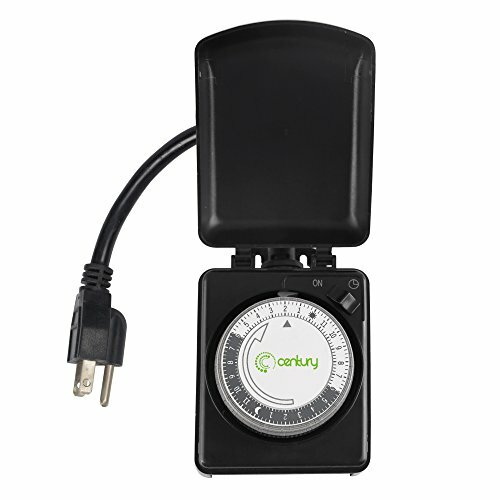 Century outdoor outlet timer will continue to function in extreme weather conditions. Perfect for your outdoor lights, pool pumps, fountains, and Christmas/ yard/patio/landscape/holiday lamps and other electric devices. 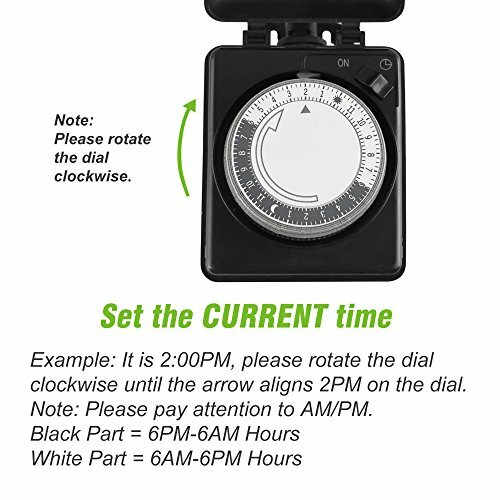 Easy setting: Turn the timer dial to the current time. Push all the pins down for the run time, and pull other pins up for the off time. 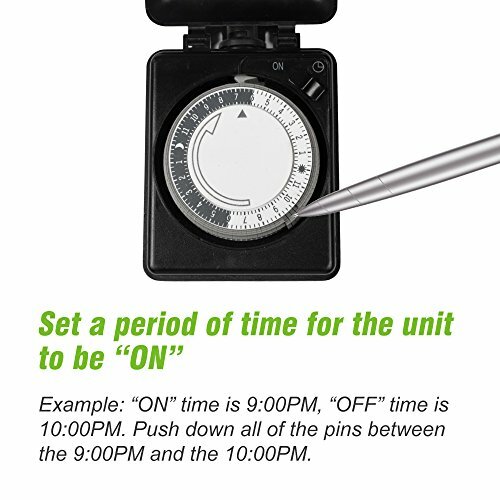 Set the manual override switch on Timer, then it will automatically turn on/off your appliance to save energy. Programmable in 15 minute intervals with 48 setting options in a 24 hours period. Total 48 ON/OFF setting per day. Repeats schedule daily with personal setting. 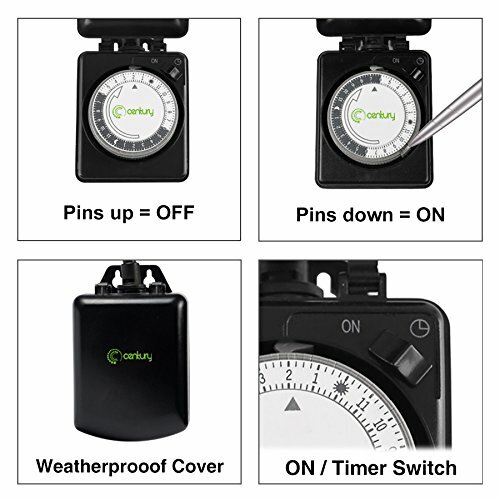 Waterproof for outdoor use: Cover provides protecting timer from weather conditions. Heavy duty material and two grounded outlet makes it safe and durable. Two 3-prong grounded outlets for use with devices like Christmas lights, fountain timers, pool pumps, patio and yard lights, as well as holiday decorations. 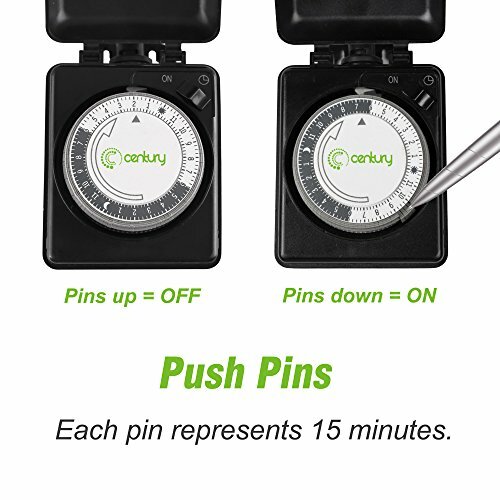 Easy mechanical timer setting: Always turn the timer dial to the current timer first, push those pins down to set the time to turn on, and pull other pins up to turn off. Switch to TIMER position to enjoy the convenience. 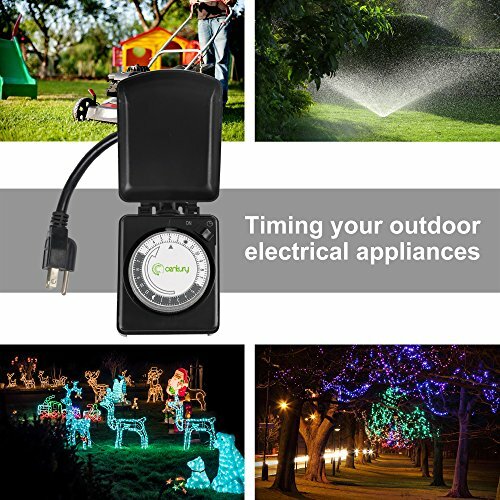 Our outdoor dual 3-prong, grounded timer outlet is ETL listed, and conforms to UL Std. 917. Rate Voltage: 125V, 60Hz, 15A Max, 1875W Resistive or General Purpose, 8A Tungsten Lamp, 1/2HP, TV-5.